Edward Tulane, a handsome, self-assured china rabbit, is gifted to 10-year-old Abilene, who completely adores him and takes loving care of him. But one day, Edward becomes lost at sea, and his secure existence changes immediately. Edward finds that much of the world is new to him; he is caught in a fisherman’s net, lands in a garbage dump, finds a traveling companion in a happy hobo, and comforts a sick child, among many challenging encounters. Kate DiCamillo’s illuminating story is magnified on stage as we follow Edward through decades of adventures, all the while realizing his inner strengths, and learning the transformative power of love. 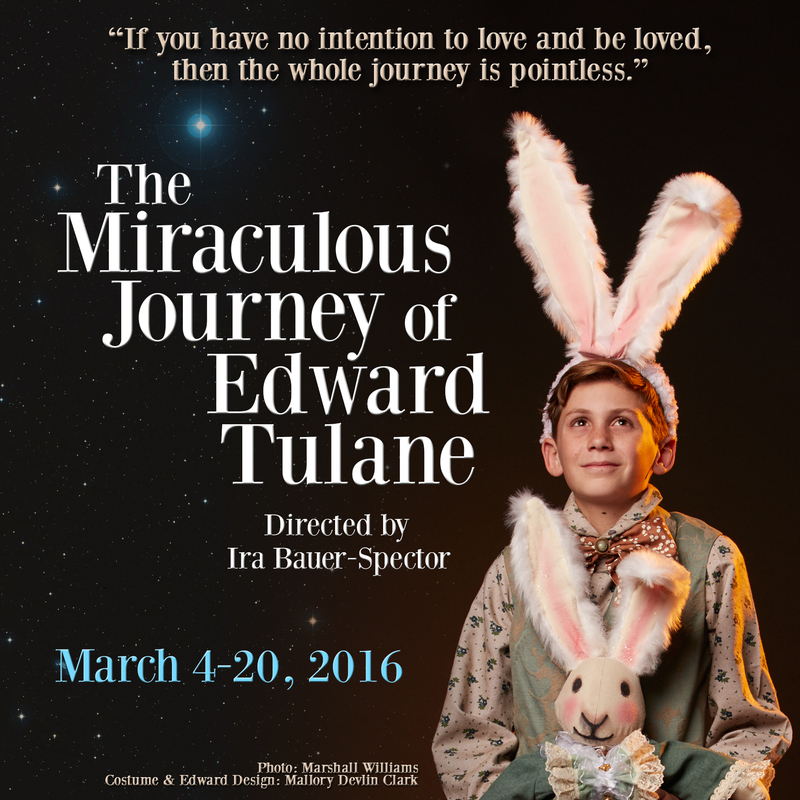 Based on Newbery-winner Kate DiCamillo’s beloved book, The Miraculous Journey of Edward Tulane is a breathtaking story of finding friendship, finding yourself, and eventually finding your way home. Follow Edward on a fantastical adventure worthy of literature’s greatest heroes. A JT Premiere! Recommended for all ages. ASL-Interpreted performance, 2pm on Saturday, March 19, 2016. Adapted for the stage by Dwayne Hartford, from the book by Kate DiCamillo. The Miraculous Journey of Edward Tulane, copyright ©2006 by Kate DiCamillo. Originally published by Candlewick Press. Used with the permission of, and presented through special arrangement with, Pippin Properties, Inc., New York, NY. Production sponsored in part by the City of San Diego Commission for Arts and Culture, the City of San Diego Park and Recreation Department, and the County of San Diego.